We break bread, we break rules, we even break-fast -- but rarely do we break the glass ceiling together. I sat down with the co-founders of Glassbreakers, a new peer mentorship platform aimed at connecting women across the tech industry and beyond. It's 2015 and only 4.2 percent of Fortune CEOs are women, out of 500 companies on the S&P there are only 24 female CEOs. How can a gender that dominates 52 percent of the workforce in America still be under-represented, under-paid and seldom promoted? Co-Founders, Lauren Mosenthal, CTO and Eileen Carey, CEO are doing their part to change these statistics by creating a solution, enter, Glassbreakers. Glassbreakers is built on a machine-learning algorithm that utilizes inputs and LinkedIn data, connecting like-minded women with similar career goals and interests. CTO, Lauren Mosenthal tells us it's, "Kind of like online dating, each user has to opt in to connect with their match before Glassbreakers make the introduction. Our goal is to use the technology we're building to connect, support and inspire women around the world to break the glass ceiling together." Knowing that the Internet is no longer a scary place to meet people online. Carey and Mosenthal sought out to engage career-oriented women who were already online -- turning their attention to mentorship opportunities and refocusing the conversation to highlight achievements, skill sets and career goals. Women are natural connectors, yet they connect in vastly different ways than men. Men automatically assume the roles of mentor and mentee. Conversely, when female mentors and mentees connect, Carey says, "Personal get's brought into the professional conversation because they are intertwined for women. " 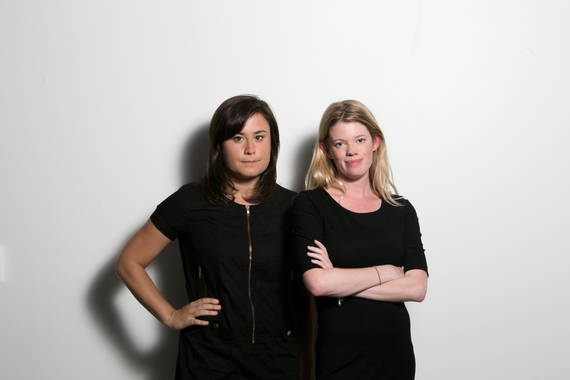 Having launched in January Carey and Mosenthal are already scaling to meet demand. Their platform isn't only about connecting you and me, it's about changing corporate culture from the inside out. Based on the deplorable stats of women in leadership roles we can't assume women will naturally rise through the ranks. There have to be tools in place to enable change. Offering a consumer and SaaS product Glassbreakers is looking to use their technology to help corporations promote from within. With three paid clients on the books (whom Carey could not disclose at this time) she walks us through the long-term plan, "We're building a SaaS product to be used at large companies to create women's peer mentorship communities within the organization. What we're building is a retention tool." She, says, "The recruitment space is really crowded; there is a drop off point where you lose women in the workforce. If you can keep them at companies you're going to have more women in leadership roles." Carey and Mosenthal are looking to raise $1-2M in a seed round of funding. With customers wanting their SaaS product they need capital to grow. Scaling has been their largest challenge to date. Over the next 18 months they are looking to add 12 people to their team in engineering and in business development. They were recently in New York seeking capital from VC funds. Yet, another hurdle to face, earning funding from a predominantly male dominated industry. How does NY stack up against SF? "There is an excellent venture capital community in NY, it's different than Silicon Valley. It's smaller, Silicon Valley can feel like a bubble and NY doesn't. Even though the tech community here is small, there is so much access to other industries, overall," Carey says, it's been a really nice experience." Do you think New York VC funds understand the need for Glassbreakers more than SF? "In NY the finance community invests in diversity," Carey says, "In San Francisco we're surrounded by technology companies that are young, and don't have as many employees, so diversity is all of a sudden something they have to think about as their companies mature. Where as in New York, there are a ton of mature companies that celebrate diversity. And inherently understand the need to connect their employees." If you build it, they will come. This mantra has come full circle for Carey and Mosenthal. Women from 18-65 have signed up and are using their platform - connecting and asking for advice. Mosenthal says engaged women on the platform are asking a variety of questions, "Older women are looking for advice about how to be better managers and leaders or to identify ways to participate in speaking engagements, as well as investment opportunities. Many ask how to manage being a working mom or pregnant in the workforce. While young connectors are looking to get through the first couple of years of their career." What's the full picture vision for Glassbreakers? Carey breaks down their vision, "I see Glassbreakers SaaS product as an off the shelf tool used by every Fortune 500 company to create supportive communities within their organizations for women. And the consumer app streamlines our mission to build a global, supported, connected community of Glassbreakers." An attainable goal. Carey and Mosenthal have created a technology companies need, and don't have the internal resources in engineering or human resources to develop on their own. They have identified a problem and created a solution to make the workplace more balanced. "We need the workplace to become balanced. The fact that it's news when a woman becomes CEO is frustrating. The fact that boards are still not 50/50 is frustrating," Carey says, "The more women connect and feel supported, the more likely we'll have balanced leadership across industries. And we're the only ones who can help us get there."